Preheat the oven to 350 degrees or 325 convect. 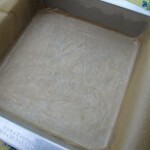 Prepare the 8 X 8 inch cake pan by brushing it with melted butter and then lining it with a piece of parchment paper that overhangs two opposite sides by about 2 inches. 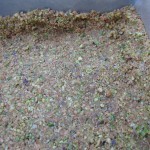 Press the nut graham mixture into the prepared pan leaving about a 1 inch crust all the way around. Bake this for about 8 - 12 minutes until slightly brown at 350 regular or 325 convect. For me, it took about 11 minutes at 325 convect. While the crust is in the oven, you can prepare the filling and just refrigerate it until you are ready to use it. 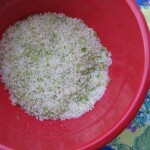 If you are using key limes, it will take extra time to render the ½ cup of lime juice. If you use regular limes, this will only take 2 – 3 limes. 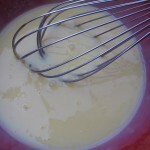 Pour the condensed milk into a medium bowl, add the two egg yolks and whisk together. Then whisk in the lime juice. Optional: If you want to line it with chocolate, when the crust is nearly cool, make the ganache. Chop up 4ozs of your favorite dark chocolate or buy your favorite dark/bittersweet chocolate chips. Place them in a medium size bowl. Heat the whipping cream to boiling on the stovetop or in the microwave. 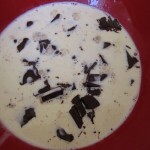 Add the boiling cream to the bowl with the chocolate and let it sit for a minute. Then start stirring in one direction with a whisk until it combines and all the chocolate is melted. It will look smooth and shiny. Let this mixture cool for a little while then you can spread it on the cooled crust with a spatula or frosting spreader to make the layer of chocolate. Place the chocolate lined crust in the fridge or freezer to harden for 15 minutes or so. If you want to learn more about making ganache and all the other ways you can use it, check out Savory Sweet Life's post or this tutorial on Baking 911. Once cooled, you can pour in the filling and bake for about 15 minutes at 350 or 325 convect to set up the filling. Take out of oven and cool on a wire rack, then place in the refrigerator to chill for at least 1 hour before serving. The bars will lift out of the pan using the parchment overhang (thanks again to Martha for this great idea!). 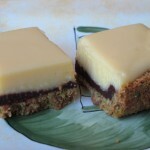 Cut into squares using a serrated knife and if you want them to look crumb-less on the sides, clean knife between each cut.